Spirit of the Jerseys State History Fair - May 9, 2015 ~ The History Girl! 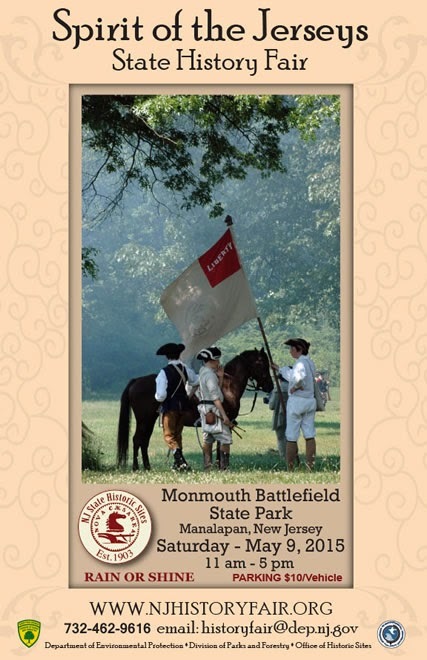 Experience five centuries of New Jersey’s history all in one place at the annual Spirit of the Jerseys State History Fair - a historical festival for all ages on Saturday, May 9, 2015 at its new location at Monmouth Battlefield State Park in Manalapan, New Jersey. This free, award-winning event, which runs from 11:00 am - 5:00 pm, rain or shine, annually draws more than 5,000 visitors. The Fair is a fun-filled adventure into New Jersey’s past with living history demonstrations, military re-enactors, tours, exhibits, period music and dance, and historical organizations and museums from around the state. There are plenty of hands-on activities for kids and adults, from participating in historical games to plowing a furrow or participating in a military drill. Don’t miss the opportunity to meet such historical figures as British General Sir Henry Clinton, Clara Barton, Walt Whitman, Molly Pitcher, and American General George Washington. Admission to the fair is free. Parking is $10 per vehicle. 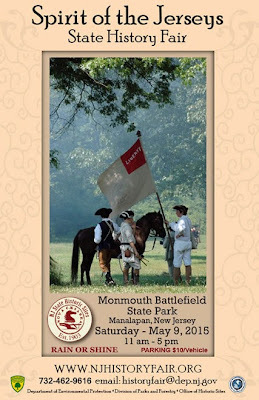 One of the largest battles of the American Revolution took place in the fields and forests that now make up Monmouth Battlefield State Park. The park preserves a splendid rural 18th-century landscape of hilly farmland and hedgerows that encompasses miles of hiking and horseback riding trails, picnic areas, a restored Revolutionary War farmhouse and a new Visitor Center that opened to the public on Flag Day 2013. The park is easily accessible from Routes 9 and 33. The Fair is sponsored by the New Jersey Department of Environmental Protection’s Office of Historic Sites, Division of Parks and Forestry, and its partners. For more information and a complete list of activities about the Fair, visit www.njhistoryfair.org or call 732-462-9616.